Click here for questions we have to date. This site is under construction right now so bear with me! A place that will answer every question that you may have. 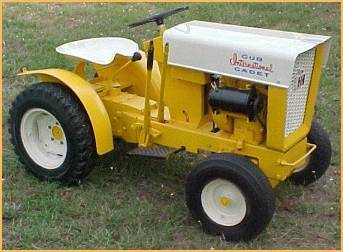 We would like to thank you for stopping by to see what has been compiled here to aide you in the restoration, repair or maintenance of your Cub cadet garden tractor or lawn mower. What we have here is a compilation of material and knowledge from many years of guys just like you, that have taken it upon themselves to share the knowledge that they have learned keeping our tractors up and running. If there is something that you think we need to add or change, please feel free to let us know and we will do our best to get it added or changed. There are to many names to list here that we would like to thank for what they have contributed to this thing/disease we call a hobby. Right now we are going to attempt to cover all models made between 1961 and 1981. But will continue to add information on all Cub Cadets as time goes on, so feel free to send us information on any Cub Cadet that have knowledge of, own or someone that does.